Brazil's government has granted an environmental licence for the construction of a controversial hydro-electric dam in the Amazon rainforest. 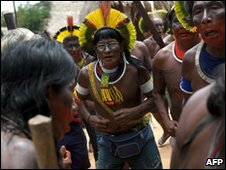 Environmental groups say the Belo Monte dam will cause devastation in a large area of the rainforest and threaten the survival of indigenous groups. However, the government says whoever is awarded the project will have to pay $800m to protect the environment. The initial approval was a key step before investors could submit bids. The government says the scheme has been modified to take account of fears that it would threaten the way of life of the indigenous peoples who live in the area. Brazilian Environment Minister Carlos Minc revealed that those who win the bidding process to build and operate Belo Monte will have to pay millions of dollars to protect the environment and meet 40 other conditions. However, critics say diverting the flow of the Xingu river will still lead to devastation in a large area of the rainforest and damage fish stocks. They say the lives of up to 40,000 people could be affected as 500 sq km of land would be flooded. When it is completed, Belo Monte would be third largest hydro-electric dam in the world, after the Three Gorges in China and Itaipu, which is jointly run by Brazil and Paraguay. It is expected to provide electricity to 23 million Brazilian homes. Critics say the Belo Monte plant will be hugely inefficient, generating less than 10% of its capacity during the three to four months of the low-water season. The project has even caused division and resignations within the government's own environment agency Ibama, which, after much delay, has now given its initial approval. Having passed this critical test the dam is now much closer to becoming a reality, but the controversy surrounding it is also unlikely to go away.